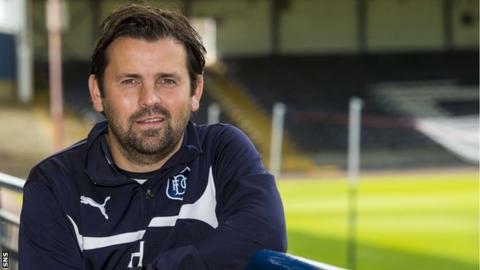 Paul Hartley says bringing better quality youth players through the Dens Park system is a key aim in restoring Dundee's fortunes. And the Dens Park manager says that the example of near neighbours Dundee United is one from which to learn. Hartley says his aim is to give the city and Dundee supporters a team to be proud of and says that staying in the Premiership this season is crucial. "We need to try to get better young players through the system," he said. "We're working hard, we understand we're a little bit behind because of the administrations and that the youth set-up went to pot." Dundee have just signed Craig Wighton, one of Scottish football's most highly-rated youth players on a new three-year contract and Hartley says he wants to produce more players like him now that the club has put those financial problems behind them. "We look at our neighbours across the road - they know how to do it," said the manager, who led Dundee to then Scottish Championship title last season. "They're producing their own players, they're making a lot of money out of their transfers, so we have to look at that. "We've stripped everything back and started again and I want to bring young players through. "We've got one just now in young Wighton, but we need more than that, so we're working hard to try to bring young and better players through the system." Hartley had been considering sending the 17-year-old out on loan, but instead the striker scored a weekend equaliser against Partick Thistle. "Wighton we feel is extra special, we want to let him develop, we don't want to get carried away with him," said the manager. "We've got to give him time to develop as a footballer. We'll bring him in and out the team when we feel it's right. "On Saturday, for 45 minutes, he was excellent. He's got a great calmness about him, a good balance and he come from a good background also, which is important." Hartley is aware of the important of avoiding relegation after last season's Championship title win. "I think stability is important for us," he added. "Off the park, we feel that we have stability there with the owners that we have in - now it's to have stability on the park. "We don't want to be a yo-yo club. We want to be a team that the city can be proud of and the supporters can be proud of and we want to stay up this year and hopefully build for year after year after that "